Gangster Squad, released on Jan. 11, is a polished gun that shines but often misses its mark. This is another brawn-over-brains Hollywood production, but it leaves viewers recalling striking scenes and cinematic sequences well after leaving the theater. Director Ruben Fleischer (Zombieland) deserves credit, if any, in his recreation of 1940’s Los Angeles. The locations, buildings, outfits, weapons and cars contribute to a beautiful film noir depiction of the crime-filled city. That being said, remarkable detail in a period film never makes up for a poor script. And that is exactly why Gangster Squad fails where other ultra-violent film productions have succeeded. It suffers from hackneyed dialogue and narration that underestimates the I.Q. of the average moviegoer. Every plot development is dictated by characters minutes before the scene unfolds on the screen. And although the scene does unfold in cinematic brilliance, the buildup leaves the audience wishing the writing were more implicit. In addition to the lackluster script, the plot is mindless. Do not expect a gripping tale of twists and turns— this one extends one simple premise. The greatest disappointment comes from the lack of character development. It seems as if each character was simply assigned a different accent and look instead of separate identities and traits. The on-screen romance between two of the major characters has no spark, and the film leaves you void of any emotional connection to the people on screen. As a result, viewers rely on gunshots and fist fights to make up for lost entertainment value. On a more positive note, the content of the film is action greased in action, with a topping of action. The combat scenes are truly remarkable, and they are consistent throughout. The shootouts are equally impressive—chaotic, suspenseful and frenzied. The period recreation and state-of-the-art action creates pure magic, but Gangster Squad is not for the faint of heart. This film has multiple scenes that are realistically gory, so moviegoers should expect to cringe in their seats. The film’s main characters are Hollywood heavy hitters. 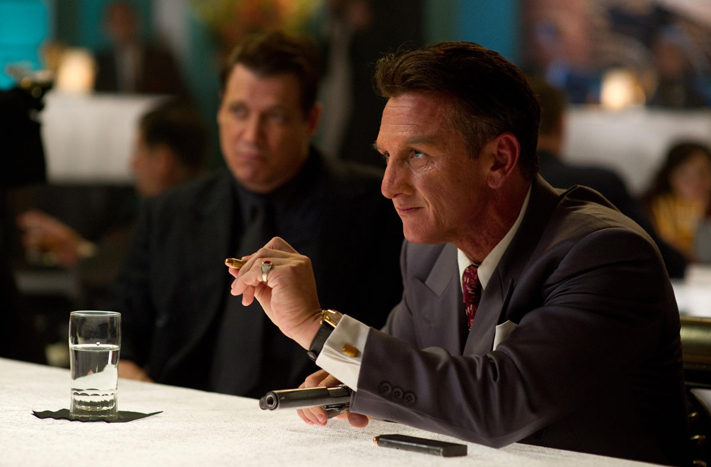 If any single actor stands out it is Sean Penn (Milk) as notorious mobster Mickey Cohen. He alone is worth the price of a ticket. Penn makes his character terrifying, despicable and ruthless, and he leaves the audience begging for more. Josh Brolin (No Country for Old Men) as Sergeant O’ Mara plays a comfortable, safe role. Emma Stone (The Help) as Grace, Mickey Cohen’s girlfriend, is wasted talent. Her character has no depth, and the rising star is too sweet to carry the promiscuous role. Ryan Gosling (Drive) as Jerry is in typical form—charming, smooth and confident. Unfortunately, he also suffers from inadequate character development. All in all, Gangster Squad is a stylized film that suffers from poor direction and writing but finds redemption in its cinematography, blood and Sean Penn.